Learn how to make delicious cannabis-infused meals and turn your love of cooking and cannabis into an art form. 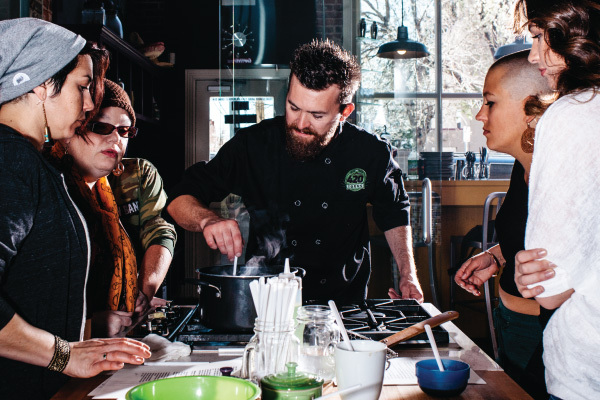 Located at Stir Cooking School in the beautiful historic Highlands area of Denver, professional chef, Travis French will guide you in the sophisticated art of cooking with cannabis. Enjoy complimentary breakfast, coffee, tea and drinks before class and meet new friends! Then, learn everything you need to know about cooking with cannabis during this 2.5 hour, hands-on cannabis cooking class. Make three mouth-watering cannabis-infused dishes at beautiful, fully-equipped cooking stations with professional grade gas stove-tops, food prep areas, pots, pans, and much more. Just some of the cannabis culinary techniques you will learn include the correct cannabis oil breakdown, decarboxylation, the benefits of infused butter versus oil, how to store your infusion, and how to make cannabis calculations when cooking. Each week offers infused cannabis appetizers, entrees, and desserts. My 420 Tours provides portioned ingredients and you can take your freshly made goodies to go!